Technique used for pure culture isolation? Both involve diluting the bacteria in a sample to an end point where a single cell divides that gives rise to a pure colony. Explain the purpose of staining microorganisms. To identify unknown/transparent organisms. The cytoplasm of bacteria is transparent. Differentiate between acidic and basic dyes. Basic dyes- Commonly used for simple staining: methylene blue, basic fuchsin, and crystal violet. (color bearing ionic groups- chromophores that are cations. Acidic dyes- Anionic (negatively charged) chromophores. They do not stain bacteria b/c of the anionic chromophore repelled by the negatively charged bacteria. Basic dyes attract to the negatively charged bacterial cell wall, due to their positive charge. Acidic dyes are opposite. 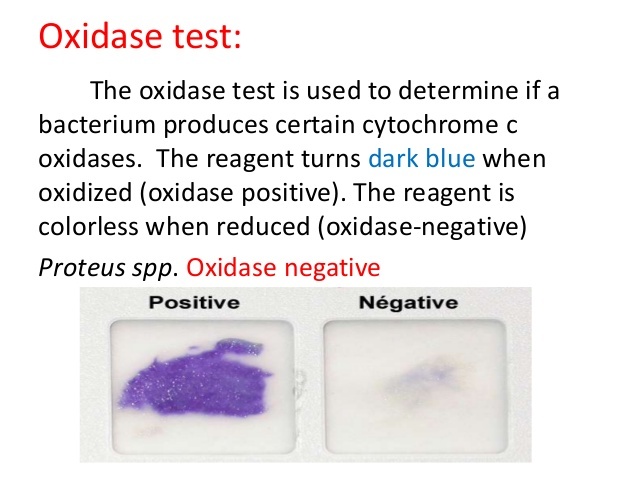 Negative stains are acidic (negatively charged) and the chromophores do not penetrate the cell instead it repelled by the similarly charged bacterial cell. Use aseptic technique to isolate the bacteria and place on slide. Pass the slide through the flame to heat-kill and fix organisms to the slide. Explain the differ rence in preparing a smear from a broth culture and a culture on solid media. Iodine- kept the crystal violet from being removed from gram+ bacteria. Alcohol- makes cells retain crystal violet and appear purple under microscope. Safranin- to color the gram negative stains pink or red. The peptidoglycan is what traps the crystal violet iodine complexes preventing their removal when the smear is decolorized. Gram Positive- remains colored, thick multi layered peptidoglycan, outer membrane is absent. Gram Negative- loses color after decolorization, thin peptidoglycan, outer membrane. Know the Gram staining procedure in detail. It is important tool in the identification of Mycobacterium tuberculosis and Mycobacterium leprae ( leprosy). It facilitates that penetration of the carbofuchsin into the cell. Heat acts as a mordanct to make stain complex more permeable to mycolic acid. Non acid fast bacteria appears blue after staining. Allow bacteria to survive environmental conditions that aren’t favorable for growth. Resistant to heat, radiation, acids, and many chemicals. Germination- when a germ or living thing begins to sprout or grow. Flagella allows cells to move toward nutrients or move away from harmful substances, such as acids. Agar is used to solidify liquid media. 1. Calculate the total amount of media needed for the experiment 2. Weigh the required amount of powder needed to dissolve in distilled water3. Dissolve the powder using the stirring rod, cover, cotton stopper and label. 4. Place in water bath (do not let it boil) to dissolve the powder 5. Sterilize in autoclave/pressure cooker. Let the medium to cool and dispense in appropriate container. Selective medium-allows certain bacteria to grow but inhibits others from growing. Differential medium- contains substances that cause some bacteria to take on an appearance that distinguishes them from other bacteria. Complex medium- exact chemical composition varies slightly. Defined medium- exact chemical composition is known. Heterotrophs- obrain their carbon from organic compounds like polysaccharides, carbs, amino acids, peptides, and proteins. Chemoorganotrophs- energy needs from the break down of organic molecules by fermentation or respiration. Chemolithotrophs- oxidize inorganic ions such as nitrate or iron to obtain energy to fix CO2. Used to sterilize culture media that are heat stable . Bacteria are colorless and difficult to see if not stained. Staining microorganisms helps with diagnosis of bacteria since it helps identify by the color differentiation of stain dyes. Acidic dyes are negatively charged, as are bacterial cell walls, so the dye is repelled. Acidic dyes bind with positively charged cells. Basic dyes are most commonly used in bacteriology. Explain why basic dyes are more effective in staining bacteria than acidic dyes. The fact that bacteria are slightly negatively charged produces a pronounced attraction between these cationic chromophores and the organism. Dyes that have anionic chromospheres the anionic chromospheres, eosinate, will not stain bacteria because of the electrostatic repelling forces that are involved. Write the initials of the organism (s) on the left-hand side of the slide with a china marking pencil. To provide a target on which to place the organisms, make a 1/2” circle on the bottom side of the slide, centrally located with a china marking pencil. Shake the culture vigorously and transfer two loopfuls of organisms to the center of the slide over the target circle. Be sure to flame the loop after it has touched the slide. Spread the organisms over the area of the target circle. Allow the slide to dry by normal evaporation of the water. Don’t apply heat. After the smear has become completely dry, pass the slide over the Bunsen burner flame to heat-kill and fix the organisms to the slide. Heat fixing denatures bacterial enzymes, preventing them from digesting cell parts, which cause the cell to break. It, also, enhances the adherence to bacterial cells to the slide. List the differential staining procedures you performed. Briefly wash off the stain, using a wash bottle of distilled water. Drain off excess water. Cover the smear with Gram’s iodine solution and let it stand for one minute. Pour off the Gram’s iodine and flood the smear with 95% ethyl alcohol for 10 to 20 seconds. This step is critical. Thick smears will require more time than thin ones. Decolorization has occurred when the solvent flows colorlessly from the slide. Stop action of the alcohol by rinsing the slide with water from wash bottle for a few seconds. Cover the smear with safranin for 20 seconds. Wash gently for a few seconds, blot dry with bibulous paper, and air dry. Examine the slide under oil immersion. Cover the smear with crystal violet and let stand for 20 seconds. Pour off the Gram’s iodine and flood the smear with 95% ethyl alcohol for 10-20 seconds. What is the difference in color between acid-fast and non acid-fast bacteria after performing the Ziehl-Neelsen Method? Acid fast is red; non acid fast is blue. Because of their though protein coats made of keratin, spores are highly resistant to normal staining procedure. Malachite green is water-soluble, is driven into the cells with heat, and does not adhere to well to the cell. It rinses easy from the cells. What is the use of agar in culture media preparation? Describe the steps involved in culture media preparation. Differential media are media that cause some bacteria to take on a different appearance from other species, allowing one to differentiate one species from another. Complex are typically made for rich extracts of meat or plants. Defined media are made by individually measuring out all components. Those that can utilize the carbon in carbon dioxide for synthesis of all cell materials are called autotrophs. If they must have one or more organic compounds for their carbon source, they are call heterotrophs. In addition, heterotrophs are carbon dioxide dependent. Chemoorganotroph is an organism that obtains energy from the oxidation of reduced organic compounds from which chemoorganotrophics organisms can generate energy and their sources of carbon is very long making these microorganisms extremely versatile. Chemolithotroph is able to use inorganic reduced compounds as a source of energy. This process is accomplished through oxidation & ATP synthesis. c. hypertonic solution Hypertonic solutions are different from isotonic solutions in that cells often lose water. Cells have a water concentration that is greater inside the cell rather than outside of the cell. Furthermore, the solutes outside of the cell are greater than the solutes inside of the cell. When osmosis uses diffusion, cells tend to lose water because the water travels from an area of high concentration (inside of the cell) to an area of lower concentration (outside of the cell). When this happens, cells can become dehydrated and die unless they are properly hydrated. The best example of a hypertonic solution would be the oceans, because the solutes (salts) outside of the cells are greater than inside of the cells. For example, if you swim in an ocean, you can observe that your body tends to dry out due to the solvent (ocean) having a greater amount of solutes than the inside of your body. d. hypotonic solution Hypotonic solutions are the complete opposite of hypertonic solutions. Cells often have a water concentration that is lower than outside of the cell. Following this, the solutes outside of the cell are less than the solutes within the cell. As a result of diffusion, cells tend to gain water because the water travels from an area of higher concentration (outside of the cell) to an area of lower concentration (inside of the cell). When cells gain water, they risk rupturing unless they maintain this balance (through a selectively permeable membrane). Freshwater habitats are examples of hypotonic solutions because the freshwater has less solutes than inside of the cells. For example, if you stay in the shower too long, you will notice that your skin can gain water and this is often called pruning. In conclusion, hypotonic, hypertonic, and isotonic solutions are a part of everyday life. Without these solutions, sea animals, freshwater animals, and medical patients could not survive. e. isotonic solution The easiest solution to understand are isotonic solutions. 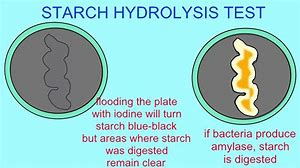 In terms of cells placed in water, they neither gain or lose water through osmosis because the concentration of solutes in the cell are equal to the solutes outside of the selectively permeable membrane. As a result, nothing happens because the concentration of water solutes outside of the cell are equal to the solutes within the cell. In the same respect, the water concentration on both sides is also equivalent. Isotonic solutions are commonly used in medical situations. For example, hospitals use isotonic saline solutions for IVs for patients. If you clean contact lenses, you use a isotonic saline solution to clean the protein from your lenses. Most cells in our bodies are isotonic. f. plasmolysis- is when plant cells lose water after being placed in a solution that has a higher concentration of solutes than the cell does. This is known as a hypertonic solution. Water flows out of the cells and into the surrounding fluid due to osmosis. This causes the protoplasm, all the material on the inside of the cell, to shrink away from the cell wall. Severe water loss that leads to the collapse of the cell wall can result in cell death. Since osmosis is a process that requires no energy on the part of the cell and cannot be controlled, cells cannot stop plasmolysis from taking place. 3. What is an antiseptic? is a substance that kills or discourages the growth and development of microorganisms on the skin, wounds and tissues of the body. Explain the filter paper disk method used for evaluating antiseptic? 4. What is the difference between antiseptic and disinfectant? Antiseptics and disinfectants are both used to kill or to limit the growth of microorganisms, however, they differ on the place they are used. An antiseptic is used on living tissues and cells to destroy any types of infections which may be living on the tissue. Disinfectants are meant to destroy microorganisms which can infect nonliving objects. Common antiseptics include mouthwash, and yeast infection treatment creams. Disinfectants are commonly found in household cleaning products for kitchens, bathrooms, and other commonly touched items where germs are found. Antiseptics and disinfectants both work to kill microbes, but antiseptics must also cause little or no harm to the tissues of the body, whereas, disinfectants need not be safe for use on living tissue. 5. Define antibiotics. Name and explain the method used for antibiotic sensitivity testing. Also, known as antibacterial, are medications that destroy or slow down the growth of bacteria. They include a range of powerful drugs and are used to treat diseases caused by bacteria. Antibiotic sensitivity or antibiotic susceptibility is the susceptibility of bacteria to antibiotics. Because susceptibility can vary even within a species (with some strains being more resistant than others), antibiotic susceptibility testing (AST) is usually carried out to determine which antibiotic will be most successful in treating a bacterial infection in vivo. Testing for antibiotic sensitivity is often done by the Kirby-Bauer method. Small wafers containing antibiotics are placed onto a plate upon which bacteria are growing. If the bacteria are sensitive to the antibiotic, a clear ring, or zone of inhibition, is seen around the wafer indicating poor growth. Other methods to test antimicrobial susceptibility include the Stokes method, Etest (also based on antibiotic diffusion), Agar and Broth dilution methods for minimum inhibitory concentration (MIC) determination. The results of the test are reported on the antibiogram. They both inhibit the growth of or kill microorganisms. Antibiotics are produced naturally from molds or bacteria. Antimicrobials can be chemically synthesized also, but the term encompasses both. a. metabolism The whole range of biochemical processes that occur within a living organism. Metabolism consists of anabolism (the buildup of substances) and catabolism (the breakdown of substances). The term metabolism is commonly used to refer specifically to the breakdown of food and its transformation into energy. b. enzymes Enzymes are built of proteins folded into complicated shapes; they are present throughout the body. The chemical reactions that keep us alive – our metabolism – rely on the work that enzymes carry out. Enzymes speed up (catalyze) chemical reactions; in some cases, enzymes can make a chemical reaction millions of times faster than it would have been without it. A substrate binds to the active site of an enzyme and is converted into products. Once the products leave the active site, the enzyme is ready to attach to a new substrate and repeat the process. f. fermentation is a metabolic process that consumes sugar in the absence of oxygen. The products are organic acids, gases, or alcohol. It occurs in yeast and bacteria, and also in oxygen-starved muscle cells, as in the case of lactic acid fermentation. reaction for acid and gas. Phenol Red Broth is a general-purpose differential test medium typically used to differentiate gram negative enteric bacteria. It contains peptone, phenol red (a pH indicator), a Durham tube, and one carbohydrate. 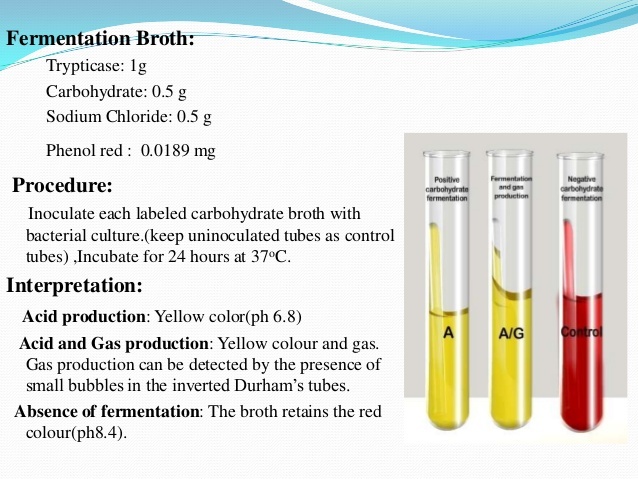 We use three different kinds of phenol red broths. One contains glucose; one contains lactose, and the last contains sucrose. The objective of the exercise is to determine which organisms can utilize each sugar. Phenol red is a pH indicator which turns yellow below a pH of 6.8 and fuchsia above a pH of 7.4. If the organism is able to utilize the carbohydrate, an acid by-product is created, which turns the media yellow. If the organism is unable to utilize the carbohydrate but does use the peptone, the by-product is ammonia, which raises the pH of the media and turns it fuchsia. When the organism is able to use the carbohydrate, a gas by-product may be produced. If it is, an air bubble will be trapped inside the Durham tube. If the organism is unable to utilize the carbohydrate, gas will not be produced, and no air bubble will be formed. 10. Describe the mixed acid fermentation test and the butanediol fermentation test . Name the media, reagents, positive reaction Methyl Red (MR) and Voges-Proskauer (VP) broth is used as a part of the IMViC tests as the medium in which both the Methyl Red and Voges-Proskauer tests can be performed. It is a simple broth that contains peptone, buffers, and dextrose or glucose. Different bacteria convert dextrose and glucose to pyruvate using different metabolic pathways. Some of these pathways produce unstable acidic products which quickly convert to neutral compounds. Some organisms use the butylene glycol pathway, which produces neutral end products, including acetoin and 2,3-butanediol. Other organisms use the mixed acid pathway, which produces acidic end products such as lactic, acetic, and formic acid. These acidic end products are stable and will remain acidic. The Methyl Red test involves adding the pH indicator methyl red to an inoculated tube of MR-VP broth. If the organism uses the mixed acid fermentation pathway and produces stable acidic end-products, the acids will overcome the buffers in the medium and produce an acidic environment in the medium. When methyl red is added, if acidic end products are present, the methyl red will stay red. NOTE: Methyl red differs from Phenol red (which is used in the fermentation test and the MSA plates) in that it is yellow at pH 6.2 and above and red at pH 4.4 and below. Phenol red turns yellow below a pH of 6.8. If you get these two pH indicators confused, you will have a difficult time interpreting test results. The VP test detects organisms that utilize the butylene glycol pathway and produce acetoin. When the VP reagents are added to MR-VP broth that has been inoculated with an organism that uses the butylene glycol pathway, the acetoin end product is oxidized in the presence of potassium hydroxide (KOH) to diacetyl. Creatine is also present in the reagent as a catalyst. Diacetyl then reacts to produce a red color. Therefore, red is a positive result. If, after the reagents have been added, a copper color is present, the result is negative. 11. The MR and VP tests are particularly useful in the identification of the Enterobacteriaceae. 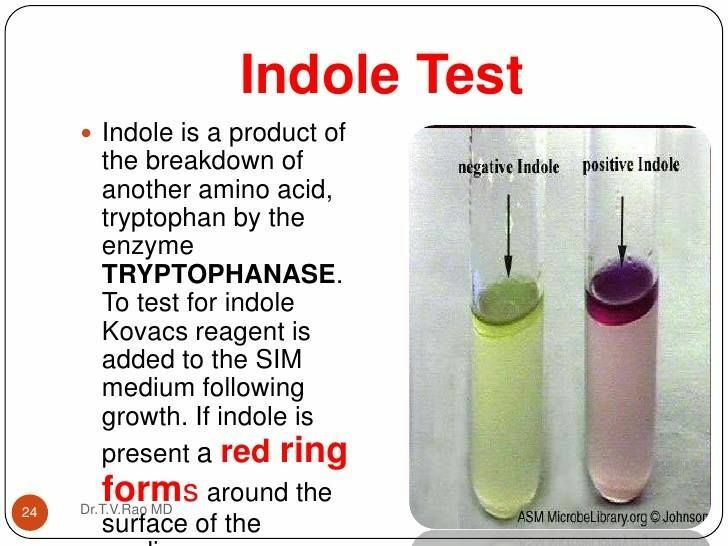 Methyl Red (MR) and Voges-Proskauer (VP) broth is used as a part of the IMViC tests as the medium in which both the Methyl Red and Voges-Prosakuer tests can be performed. It is a simple broth that contains peptone, buffers, and dextrose or glucose. Different bacteria convert dextrose and glucose to pyruvate using different metabolic pathways. Some of these pathways produce unstable acidic products which quickly convert to neutral compounds. Some organisms use the butylene glycol pathway, which produces neutral end products, including acetoin and 2,3-butanediol. Other organisms use the mixed acid pathway, which produces acidic end products such as lactic, acetic, and formic acid. These acidic end products are stable and will remain acidic. The Methyl Red test involves adding the pH indicator methyl red to an inoculated tube of MR-VP broth. If the organism uses the mixed acid fermentation pathway and produces stable acidic end-products, the acids will overcome the buffers in the medium and produce an acidic environment in the medium. When methyl red is added, if acidic end products are present, the methyl red will stay red. 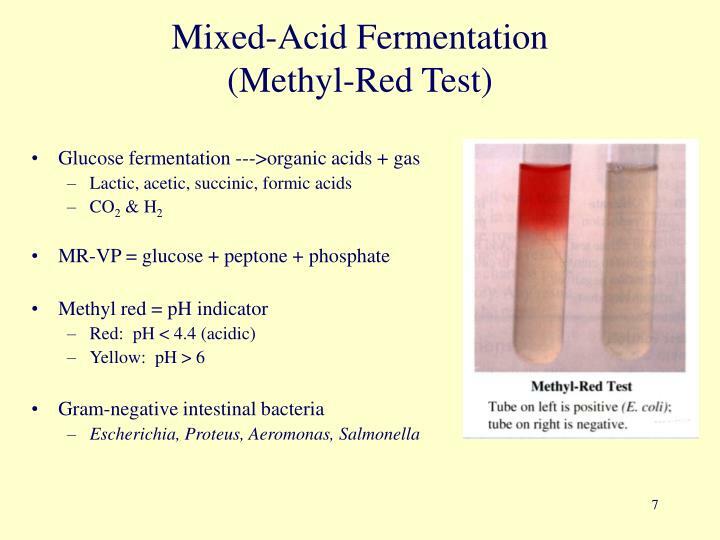 NOTE: Methyl red differs from Phenol red (which is used in the fermentation test and the MSA plates) in that it is yellow at pH 6.2 and above and red at pH 4.4 and below. Phenol red turns yellow below a pH of 6.8. If you get these two pH indicators confused, you will have a difficult time interpreting test results. The VP test detects organisms that utilize the butylene glycol pathway and produce acetoin. When the VP reagents are added to MR-VP broth that has been inoculated with an organism that uses the butylene glycol pathway, the acetoin end product is oxidized in the presence of potassium hydroxide (KOH) to diacetyl. Creatine is also present in the reagent as a catalyst. Diacetyl then reacts to produce a red color. Therefore, red is a positive result. If, after the reagents have been added, a copper color is present, the result is negative. The MR and VP tests are particularly useful in the identification of the Enterobacteriaceae. 12. 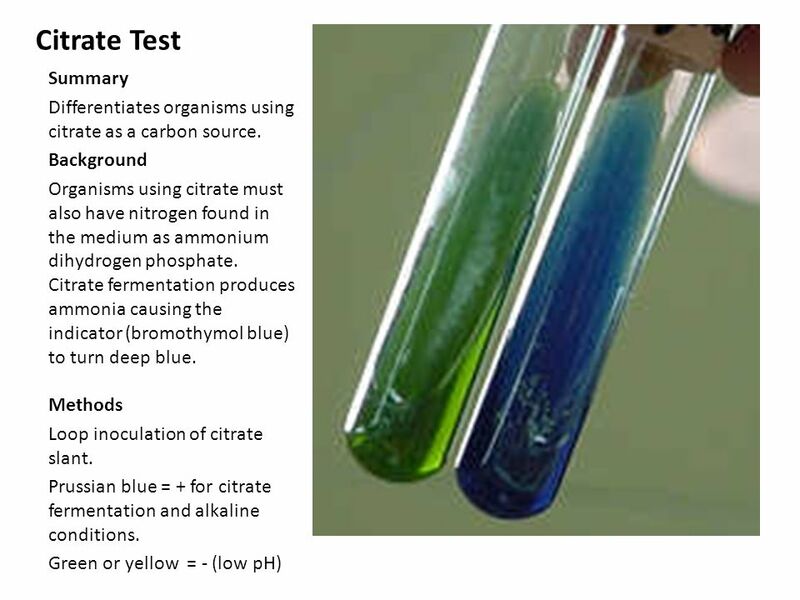 Describe the catalase test and the oxidase test. Function of these enzymes? Positive test result? To identify organisms that produce the enzyme catalase. To differentiate members of the catalase-positive Micrococcaceae from the catalase-negative Streptococcaceae. Converts hydrogen peroxide into water and gaseous oxygen. Smear bacteria on slide and add hydrogen peroxide on top. – If the bacteria is catalase-positive, then oxygen gas bubbles form immediately. – If the bacteria is catalase-negative, then no bubbles appear. Because catalase converts the hydrogen peroxide into water and gaseous oxygen. To identify bacteria containing the respiratory enzyme Cytochrome C Oxidase. It is useful in differentiating the oxidase-negative Enterobacteriaceae from the oxidase-positive Pseudomonadacae + Neisseria. – Smear bacteria on slide and add the reducing reagent. – If the reducing agent becomes oxidized, the bacteria turns purple. Indicates a positive result. – If the bacteria remains clear, the result is negative. 13. Name two bacterial genera that are oxidase positive. It is useful in differentiating the oxidase-negative Enterobacteriaceae from the oxidase-positive Pseudomonadacae + Neisseria. 14. Name a bacteria that is catalase positive. What is the significance of the catalase test? To differentiate members of the catalase-positive Micrococcaceae from the catalase-negative Streptococcaceae. Converts hydrogen peroxide into water and gaseous oxygen. tests are used to study the physiological characterristics of bacteria from the Family Enterobacteriaceae, especially Escherichia and Enterobacter. G. Urea hydrolysis urea agar slant urea broth–contains a yeast extract, monopostassium phosphate, disodium phosphate, urea, and phenol red indicator. I. Phenylalanine deamination Phenylalanine Slant After incubation, five drops of 10% ferric chloride and five drops of 0.1N HCl are added and the tube is gently shaken. A positive result is indicated if a green color develops within five minutes. 23. What is the significance of urease test in the identification of Proteus? The urease test is useful in identifying the genera Proteus, Providentia, and Morganella, which liberate this enzyme. 24. What are the products of cysteine hydrolysis? What is the significance of this test in the identification of Proteus? One way is by utilizing SO42- (sulfate) or S2O32- (thiosulfate) as the final electron acceptor in anaerobic respiration. There are also microbes that can metabolically oxidize S containing compounds (e.g., cysteine) to obtain carbon and energy. Thiosulfate reductase and cysteine desulfurase are the enzymes that lead to the production of H2S by the two ways mentioned above. H2S is a colorless, water soluble, gas with a rotting egg odor. Ferrous ion (Fe2+) is an indicator that can be utilized in detecting H2S(g). 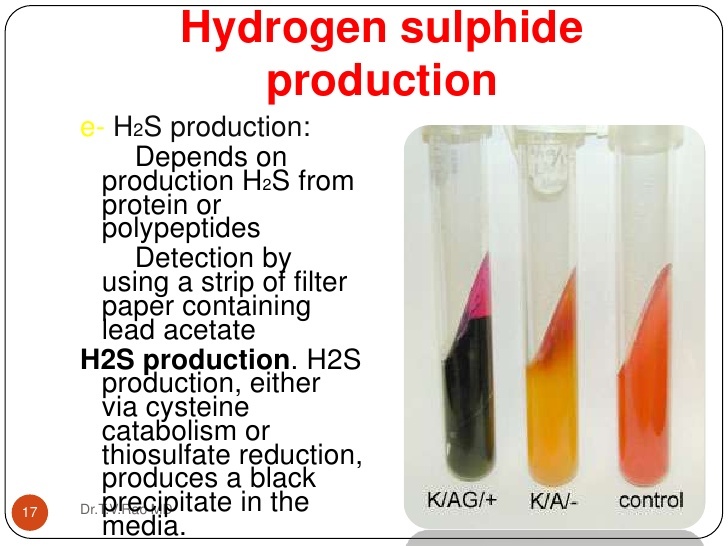 It combines with H2S(g) and forms the insoluble black precipitate ferrous sulfide (FeS). 26. What would happen to microbes that produce hydrogen peroxide in the absence of catalase production? Toxic to the cells. Eye piece: The lens the viewer looks through to see the specimen. The eyepiece usually contains a 10X or 15X power lens. A standard microscope has three, four or five objective lenses that range in power from 4x to 100x. When focusing the microscope, be careful that the objective lens doesn’t touch the slide, as it could break the slide and destroy the specimen. On/Off switch: The switch on the base of the microscope turns the illuminator off and on. Define resolving power. Resolving power is the resolution (resolving power) of a microscope means its ability to distinguish two items at its highest magnification. The same goes for any other optical instrument. It’s like watching two lines which are extremely close to each other with unaided eye and then watching them with the microscope. With the unaided eye they will appear as one line and with the microscope they will appear distinct. Define working distance. The working distance is determined by the linear measurement of the objective front lens to the specimen surface. Define total magnification. Total magnification is determined by multiplying the eyepiece power (usually 10x) by the objective lens in place. For example, a 10x eyepiece and a 4x objective yields a total magnification of 40x (40 power). Define parfocalization. A parfocal lens is actually a lens that stays in focus when there is change in the magnification, or focal, length. The amount of focus error is so small in fact, its considered insignificant. What is the resolution of a compound microscope? Microscope resolution is the most important determinant of how well a microscope will perform and is determined by the numerical aperture and light wavelength. It is not impacted by magnification but does determine the useful magnification of a microscope. List the characteristics of protozoa, algae, and cyanobacteria. Cyanobacteria = photosynthetic pigments, cell wall; algae = nucleus, photosynthetic pigments, chloroplasts, cell wall; protozoa = nucleus, flagella, pseudopodia, cilia. Cyanobacteria is in the domain bacteria, protozoa, is in the domain eukarya, and algae is in the domain eukarya. What is the significance of aseptic technique? Aseptic technique involves using only uncontaminated equipment and fluids. It involves sterilizing with a machine or passing through a flame. List the characteristics of bacteria. Describe bacterial morphology and arrangements. Characteristics of bacteria are prokaryotes, meaning they do not have membrane bound organelles, peptidoglycan cell wall, and asexual reproduction, meaning they one need themselves to multiply. When viewed under light microscope, most bacteria appear in variations of three major shapes: The rod (bacillus), the sphere (coccus) and the spiral type (vibrio). In fact, structure of bacteria has two aspects, arrangement and shape. So far as the arrangement is concerned, it may Paired (diplo), Grape-like clusters (staphylo) or Chains (strepto). In shape they may principally be Rods (bacilli), Spheres (cocci), and Spirals (spirillum). The average diameter of spherical bacteria is 0.5-2.0 µm. For rod-shaped or filamentous bacteria, length is 1-10 µm. The three basic bacteria shapes are coccus (spherical), bacillus, (rod-shaped), and spiral (twisted), however pleomorphic bacteria can assume several shapes. List the characteristics of fungi. And explain the differences between yeast and mold. Fungi are eukaryots. They reproduce by means of spores, and they reproduce both sexually and asexually. They are nonvascular, and they are heterotrophic. Fungi store their food as starch. They have a small nucleus. They digest their food before they ingest it. They are nonmotile. They have cell walls composed of chitin. Molds and yeast, both are a type of fungi. The main difference between mold and yeast is, mold is grown in multi-cellular filaments or hyphae while yeast grow as a single cell and not in the form of multi-cellular filaments unlike mold. Define Myceteae. = Eukaryotes, Possess ergosterol in cell membrane. Cell walls made of carbs, yeast, and molds. Saprobes. = feeding on dead organic material. Mycology. = The formal study of the fungi, especially regarding biology, classification, culture, laboratory analysis and edibility. Dimorphic. = Dimorphic fungi are those fungi that exist either in yeast form or as mold (mycelial form) depending on environmental conditions, physiological conditions of the fungus or the genetic characteristics. List the steps involved in smear preparation from liquid media and solid media. Spread one or two loopfuls of the liquid over a large area of a clean slide. Allow the liquid to evaporate (“air dry”) prior to fixation. This attachment process is accomplished by passing the slide over the flame of a Bunsen burner two or three times. Because the slide may become hot, it is advisable to use a slide holder. Be careful, however, not to incinerate the organism on the slide. Proper fixation does not require extremely prolonged exposures to heat. Place one or two loopfuls of water on the slide. Using an inoculating needle, mix a very small quantity of the colony with the water and spread over the slide. It is critical that microbes are separated from each other during this step.. Air drying and heat fixation are performed as described above. What are the reasons for heat-fixing the slide during smear preparation? Causes the cells to adhere to the slide so it won’t wash off. Differentiate between simple and differential staining. A simple stain depends on the fact that bacteria differ chemically from their surroundings and thus can be stained with their environments. A differential stain can distinguish between 2 types of bacteria because bacteria differ from one another chemically and physically to react differently to a given staining procedure. Differentiate between basic and acidic dyes. Basic dyes are positively charged and work with negatively charged tissue components, while acidic dyes are negatively charged and instead work with tissue components that are positively charged. Basic dyes are constructed from cationic salts of colored bases, and acidic salts consist of salt of a sulfuric, phenolic or carboxylic organic acid. Acidic dyes are more often used in labs as a dye bath and are effective in staining textiles because they are made up of protein fibers. These dyes bind best to animal hair such as wool or alpaca hair. Basic dyes work better staining synthetic materials like nylon, polyester, modacrylic and olefin. Define capsule. Why is it difficult to stain capsule by ordinary methods? The capsule stain employs an acidic stain and a basic stain to detect capsule production. Capsules are formed by organisms such as Klebsiella pneumoniae. Most capsules are composed of polysaccharides, but some are composed of polypeptides. The capsule differs from the slime layer that most bacterial cells produce in that it is a thick, detectable discrete layer outside the cell wall. Some capsules have well-defined boundaries, and some have fuzzy, trailing edges. Capsules protect bacteria from the phagocytic action of leukocytes and allow pathogens to invade the body. If a pathogen loses its ability to form capsules, it can become avirulent. Bacterial capsules are non-ionic, so neither acidic nor basic stains adhere to their surfaces. Therefore, the best way to visualize them is to stain the background using an acidic stain and to stain the cell itself using a basic stain. We use India ink and Gram crystal violet. This leaves the capsule as a clear halo surrounding a purple cell in a field of black. The medium in which the culture is grown as well as the temperature at which it is grown and the age of the culture will affect capsule formation. Older cultures are ore likely to exhibit capsule production. When performing a capsule stain on your unknown, be sure the culture you take your sample from is at least five days old. Explain the gram staining procedure. Function of each reagent? Difference in appearance of gram positive and gram negative. What is the basis of this classification. Gram staining is a common technique used to differentiate two large groups of bacteria based on their different cell wall constituents. The Gram stain procedure distinguishes between Gram positive and Gram negative groups by coloring these cells red or violet. Gram positive bacteria stain violet due to the presence of thick layer of peptide glycan in their cell walls, which retains the crystal violet these cells are stained with. Alternatively, Gram negative bacteria stain red, which is attributed to a thinner peptidoglycan wall, which does not retain the crystal violet during the decoloring process. Cells are stained with crystal violet dye. Next, the Gram’s iodine solution (iodine and potassium iodide) is added to form a complex between the crystal violet and iodine. This complex is a larger molecule than the original crystal violet stain and iodine is insoluble in water. A decolorizer such as ethyl alcohol or acetone is added to the sample, which dehydrates the peptidoglycan layer, shrinking and tightening it. The large crystal violet-iodine complex is not able to penetrate this tightened peptidoglycan layer and is thus trapped in the cell in Gram positive bacteria. Conversely, the outer membrane of Gram negative cells is unable to retain the crystal violet-iodine complex and the color is lost. Make a slide of cell sample to be stained. Heat fix the sample to the slide by carefully passing the slide with a drop or small piece of sample on it through a Bunsen burner three times. Add the primary stain (crystal violet) to the sample/slide and incubate for 1 minute. Rinse slide with a gentle stream of water for a maximum of 5 seconds to remove unbound crystal violet. Add Gram’s iodine for 1 minute-this is a mordant, or an agent that fixes the crystal violet to the bacterial cell wall. Rinse sample/slide with acetone or alcohol for – 3 seconds and rinse with a gentle stream of water. The alcohol will decolorize the sample if it is Gram negative, removing the crystal violet. However, if the alcohol remains on the sample for too long, it may also decolorize Gram positive cells. Add the secondary stain, safranin, to the slide and incubate for 1 minute. Wash with a gentle stream of water for a maximum of 5 of seconds. If the bacteria is Gram positive, it will retain the primary stain (crystal violet) and not take the secondary stain (safranin), causing it to look the primary violet/purple under a microscope. If the bacteria is Gram negative, it will lose the primary stain and take the secondary stain, causing it to appear red when viewed under the microscope. What is the function of Endospores. Bacterial genera that produces endospores. Reason why spores are not stained by ordinary methods. Stains used and the procedure involved in staining spores by the Schaeffer-Fulton method. The function of bacterial endospores, according to Cornell University, is to allow the survival of bacteria’s cell lines through harsh conditions that would kill a normal member of the species. These conditions that would kill a normal member of the species. The endospore stain is a differential stain which selectively stains bacterial endospores. The main purpose of endospore staining is to differentiate bacterial spores from other vegetative cells and to differentiate spore formers from non-spore formers. In the Schaeffer-Fulton’s method, a primary stain-malachite green, is forced into the spore by steaming the bacterial emulsion. Malachite Green is water soluble and has a low affinity for cellular material, so vegetative cells may be decolorized with water. Safranin is then applied to counterstain any cells which have been decolorized. At the end of the staining process, vegetative cells will be pink, and endospores will be dark green. Spores may be located in the middle of the cell, at the end of the cell, or between the end and middle of the cell. Spore shapes can be spherical or elliptical. Reagents used for Endospore staining are Primary stain – Malachite green. Decolorizing agent – Tap or distilled water. Counterstain stain – Safranin. And Ethanol. Take a clean grease free slide and make smear using sterile technique. Air dry and heat fix the organism on a glass slide and cover with a square of blotting paper or toweling cut to fit the slide. Saturate the blotting paper with malachite green stain solution and steam for 5 minutes, keeping the paper moist and adding more dye as required. Alternatively, the slide may be steamed over a container of boiling water. Wash the slide in tap water. Counterstain with 0.5% safranin for 30 seconds. Wash with tap water; blot dry. Examine the slide under the microscope for the presence of endospores. Endospores are bright green and vegetative cells are brownish red to pink. What is the medical importance of acid fast staining? What are the organisms that are acid fast and what makes them acid fast? Which dyes are used and the experimental procedure? What is the hanging drop method and tube method for determining mobility. Hanging drop preparation is a special type of wet mount (in which a drop of medium containing the organisms is placed on a microscope slide), often is used in dark illumination to observe the motility of bacteria. In this method a drop of culture is placed on a coverslip that is encircled with petroleum jelly (or any other sticky material). The coverslip and drop are then inverted over the well of a depression slide. The drop hangs from the coverslip, and the petroleum jelly forms a seal that prevents evaporation. This preparation gives good views of microbial motility. Pathogenic organisms have their motility determined by soft agar stabbing, which is also known as the tube method. Because pathogenic organisms are dangerous, the tube method is used. This method cultures the organisms in medium, which allows the organisms to move in a manner that is monitored. The pathogenic organisms in the medium that are not motile simple grow and remain in the same place, but motile organisms grow and start to move in a way that creates a form of detectable cloudiness. While examining living organism for the property of active locomotion, it is essential to distinguish true motility, whereby the organism move in different directions and change their positions in the field. Define culture medium. What is the purpose of agar in culture media? A culture media is a special medium used in microbiological laboratories to grow different kinds of microorganisms. A growth or a culture medium is composed of different nutrients that are essential for microbial growth. An agar plate is a Petri dish that contains a solid growth medium, typically agar plus nutrients, used to culture small organisms such as microorganisms. Sometimes selective compounds are added to influence growth, such as antibiotics. Define autotrophs = An organism capable of synthesizing its own food from inorganic substances, using light or chemical energy. Green plants, Algae, and certain bacteria. Autotrophs are the producers in a food chain, such as plants on land or algae in water. Define Heterotrophs = Any organism that cannot manufacture its own food and instead obtains its food and energy by taking in organic substances, usually plant or animal matter. Define phototrophs = Any organism that derives its energy for food synthesis from light and is capable of using carbon dioxide as its principal source of carbon. Define chemoautotrophs = An organism (typically a bacterium or a protozoan) that obtains energy through chemo synthesis rather than by photosynthesis. Chemoautotrophs use chemical energy to produce carbohydrates. Chemoheterotrophs = are heterotrophic organisms that are not capable of fixing carbon to form their own organic compounds. Most chemoheterotrophs obtain energy by ingesting organic molecules like glucose. Photoheterotrophs = An organism that depends on light for most of its energy and principally on organic compounds for its carbon. They are heterotrophic organisms that make use of light energy as their energy source. Growth factor = Growth factors are naturally occurring regulatory molecules which bind to receptors on the cell surface. They stimulate cell and tissue function through influencing cell differentiation by changing their biochemical activity and cellular growth, and regulating their rate of proliferation. Differentiate between synthetic and non-synthetic media. When a medium is composed of chemically defined components, it is referred to as a synthetic medium. On the other hand, if a medium contains chemically undefined compounds (e.g. vegetable extract, fruit juice, plant extract), it is regarded as a natural medium. Differentiate between selective and differential media. Selective and differential media are two types of media used to isolate and identify microorganisms. The main difference between the two is that selective media are used to isolate a particular strain of microorganisms whereas differential media are used to identify and differentiate a closely related group of microorganisms. Selective media use specific growth characteristics of a microorganism to selectively grow that microorganism in the growth medium. Differential media allow the characterization of several microorganisms based on the growth patterns of them. Time and temperature used for autoclaving. They are also used in industrial applications, especially regarding composites. Many autoclaves are used to sterilize equipment and supplies by subjecting them to high pressure saturated steam at 121 degrees Celsius or 249 degrees Fahrenheit for around 15 – 20 minutes depending on the size of the load and the contents. Method used for isolation of organisms into a pure culture. A pure culture theoretically contains a single bacterial species. There are a number of procedures available for the isolation of pure cultures from mixed populations. A pure culture may be isolated by the use of special media with specific chemical or physical agents that allow the enrichment or selection of one organism over another. One can use spread or streak plating to isolate individual bacterial cells on a nutrient medium. Both procedures require understanding of the aseptic technique. Asepsis can be defined as the absence of infectious microorganisms. However, the term is usually applied to any technique designed to keep unwanted microorganisms from contaminating sterile materials. What are the steps involved in quantitative plating. Used to measure bacterial growth by counting the number of bacterial cells. Two steps serial dilution & plating (pour or spread). Dilutions are useful in science when making solutions or growing an acceptable number of bacterial colonies to count. There are three formulas used to work microbiology dilutions problems: finding individual dilutions, finding serial dilutions, and finding the number of organisms in the original sample. Countable plate = 30 to 300 colonies. Optimum temperature is the temperature at which a procedure is best carried out, such as the culture of a given organism or the action of an enzyme. Maximum temperature is the temperature at which a procedure is best carried out, such as the culture of a given organism or the action of an enzyme. Minimum temperature is the temperature that an organism is capable of growth between about 0 degrees Celsius to 30 degrees Celsius. Hyperthermophiles or extreme thermophiles are microbes who are members of the Archaea that have a optimum growth temperature of 80 degrees Celsius or higher. Mesophile is an organism that grows best in moderate temperature, neither too hot nor too cold, typically between 20 to 45 degrees Celsius (68 and 113 degrees Fahrenheit). The optimal temperature I 37 degrees C. The term is mainly applied to microorganisms. Psychrophiles or cryophiles are extremophilic organisms that are capable of growth and reproduction in low temperatures, ranging from -20 degrees C to +10 degrees C. They are found in places that are permanently cold, such as the polar regions and the deep sea. Thermophile is an organism (type of extremophile) that thrives at relatively high temperatures, between 41 and 122 degrees C (106 and 252 degrees F). Many thermophilic eubacteria suggested to have been among the earliest bacteria. Thermal death time is how long it takes to kill a specific bacteria at a specific temperature. It was originally developed for food canning and has found applications in other industries. Thermal death point is the temperature at which all organisms of a culture will be killed by heat either instantaneously or within an arbitrary brief finite period. Hypotonic is any solution that the total molar concentration of all dissolved solute particles is less than another solution. In a hypotonic solution a cell will burst. Hypertonic is any solution that the total molar concentration of all dissolved solute particles is greater than another solution. In a hypertonic solution a cell will shrivel up. Isotonic solution is one that has the same osmolarity, or solute concentration, as another solution. If these two solutions are separated by a semipermeable membrane, water will flow in equal parts out of each solution and into the other. In an isotonic solution the cell will maintain structure. Plasmolysis – The shrinking of protoplasm away from the cell wall of a plant or bacterium due to water loss from osmosis, thereby resulting in gaps between the cell wall and cell membrane. Osmophiles are microorganisms adapted to environments with high osmotic pressures, such as high sugar concentration. Osmophiles are similar to halophilic (salt loving) organisms because a critical aspect of both types of environment is their low water activity. High sugar concentrations represent a growth limiting factor for many microorganisms, yet osmophiles protect themselves against high osmotic pressure by the synthesis of osmoprotectants such as alcohols and amino acids. Many osmophilic microorganisms are yeasts, a variety of bacteria also osmophilic. Halophile is an organism that thrives in an environment of high salinity. Antiseptics is a substance that kills or discourages the growth and development of microorganisms on the skin, wounds and tissues of the body. Antiseptics and disinfectants are both used to kill or to limit the growth of microorganisms, however, they differ on the place they are used. Disinfectants are meant to destroy microorganisms which can infect nonliving objects. Common antiseptics include mouthwash, and yeast infection treatment creams. Both work to kill microbes, but antiseptics must also cause little or no harm to the tissues of the body, whereas disinfectants need not be safe for use on living tissue. It is also known as an antibacterial and are medications that destroy or slow down the growth of bacteria. 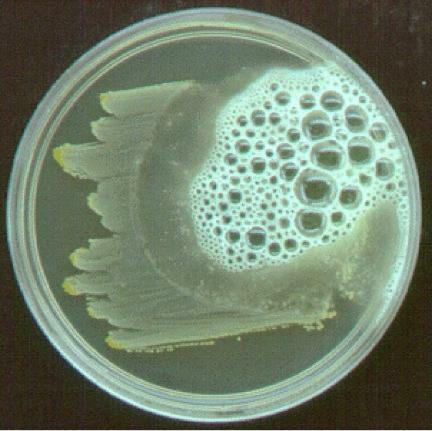 The zone of inhibition is the clear region around the paper disc saturated with an antimicrobial agent on the agar surface. The clear region is an indication of the absence, or the effective inhibition, of microbial growth by the antimicrobial agent. The Kirby-Bauer method for testing antibiotic sensitivity is also called disk diffusion test and agar diffusion test. It is a test of the antibiotic sensitivity of bacteria. It uses antibiotic disks to test the extent to which bacteria are affected by those antibiotics. Metabolism is the whole range of biochemical processes that occur within a living organism. Metabolism consists of anabolism (the buildup of substances) and catabolism (the breakdown of substances). The term metabolism is commonly used to refer specifically to the breakdown of food and its transformation into energy. Fermentation is a metabolic process that consumes sugar in the absence of oxygen. The products are organic acids, gases, or alcohol. It occurs in yeast and bacteria, and also in oxygen-starved muscle cells, as in the case of lactic acid fermentation. Endoenzyme retained intracellularly (inside the cell); internal metabolic functions ex: catalase, oxidase, reductase, hydrogen peroxide. Exoenzyme active extracellularly, break down harmful chemical and large food molecules breaks down host tissue and facilitates invasion ex: cellulase, amylase (starch, glucose), penicillinase, keratinase. Oxidation is the loss of electrons during a reaction by a molecule, atom, or ion. Oxidation occurs when the oxidation state of a molecule, atom or ion is increased. Enzymes are built of proteins folded into complicated shapes, they are present throughout the body. The chemical reactions that keeps us alive – our metabolism – rely on the work that enzymes carry out. 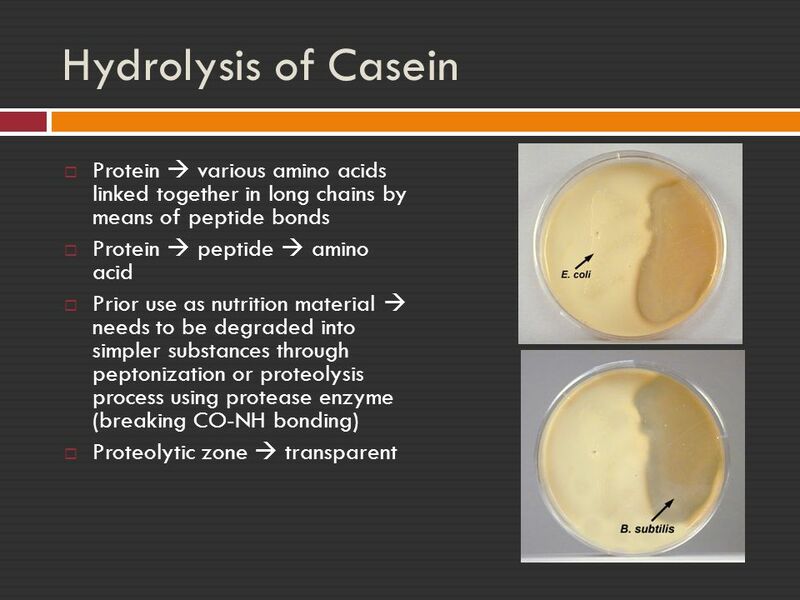 Catalase function- Catalase is a common enzyme, found in nearly all living organisms. It catalyses hydrogen peroxide into water and oxygen and protects organisms from free radicals It also has industrial uses to prevent certain contaminants in food and as a disinfectant for contact lenses and a cleansing agent in some other products. 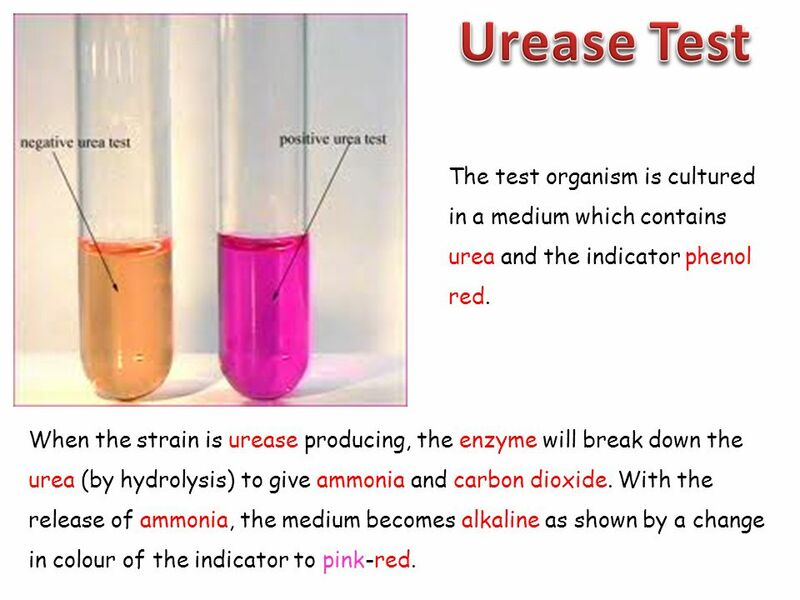 Urease function- Urease presents in many bacteria, fungi and higher plants. Its main function is to allow these organisms to gain nitrogen. However, the urease in the bacteria in soil will also cause the urea in fertilizer to be hydrolyzed, resulting in loss of fertilizer. Amylase function- The primary function of an amylase enzyme is to break down starches, which results in simple sugars such as fructose, maltose, glucose and dextrine. This function of amylase occurs in the human body, but is also put to use in food and beverage processing and other industries. Lipase function- A lipase is any enzyme that catalyzes the hydrolysis of fats. Lipases are a subclass of the esterases. Lipases perform essential roles in digestion, transport and processing of dietary lipids in most, if not all, living organisms. Genes encoding lipases are even present in certain viruses. Most lipases act at a specific position on the glycerol backbone of a lipid substrate. These four tests include an important series of determinations which are collectively called the IMViC reaction series. The IMViC reaction series allows the discrimination of bacteria of the Enterobacteriaceae family. Positive Negative. Ferric chloride (FeCl3) reacts with the phenylpyruvic acid (if present) and changes color from yellow to green — a positive result. Positive Negative.